Burnley have made a number of general enquiries about Swansea players – believed to be midfielder Sam Clucas and centre back Alfie Mawson.. But there are no deals imminent as of yet. The club have held informal conversations with the Swans, but have yet to make an offer for either player. Dyche has long been an admirer of Clucas, 27, having been knocked back with a couple of attempts to sign the former Hull City man last summer, prior to his switch to the Liberty Stadium. The Tigers' player of the year arrived from Chesterfield for £1.3m in 2015, before moving to South Wales for a fee in the region of £15m. The £12m rated one-time England C representative, who featured in a 6-1 win over Bermuda in 2013, had essentially been brought in as Jack Cork's replacement at Swansea City following the latter's £10m move to Turf Moor a month prior. Mawson, meanwhile, joined Swansea from Barnsley two summers ago, and has forged his way into Gareth Southgate’s thinking, with the centre back in the squad for the friendlies with Holland and Italy in March, without making his Three Lions debut. 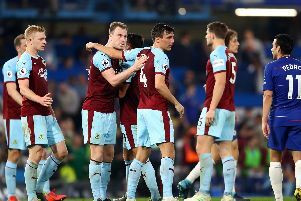 The transfer window closes three weeks on Thursday, ahead of the new Premier League season, and Dyche said: “It’s the usual really, I think it’s difficult to affect it with the way the club is run. “We don’t want to lose the club’s values, so we have to be patient, that’s the key, we can’t just go and cherry pick players. It’s not an easy situation, the way we go about it makes it tougher, so we have to bide our time.